MISSION STATEMENT: Serving local customers with local style. 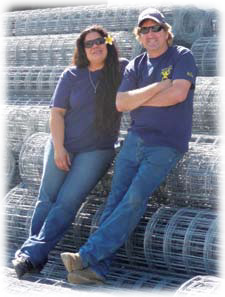 Kila Manufacturing (Kilaman) was established in March 2010 as a woman-owned minority business, operated by Jodi Heininger and Scott Biddle, specializing in the manufacture of welded wire reinforcing (WWR). Starting a manufacturing business in Hawaii is no small endeavor, nor is it common. Yet when Kilaman had the opportunity to purchase the only welded wire machine in the state of Hawaii in 2005 – rescuing it from being shipped out of the state – that’s exactly what needed to be done. After conducting research about imported WWR, Kilaman determined there was a need for a locally manufactured product at reasonable prices. Previously all WWR sold in the state had been imported from the mainland or from abroad, and the imported product was only sold in 40-foot container quantities. Kilaman gives the construction industry an alternative source for their WWR needs. Located in Campbell Industrial Park, Kilaman’s brand new manufacturing facility is custom designed specifically for the production of WWR to include two overhead crane systems for material handling and product flow. The firm’s welded wire machine is capable of producing more than 300,000 square feet of WWR per day, consuming 80,000 pounds of raw material, and its capabilities far exceed the current local demand. Kilaman keeps a large inventory of all sizes, including galvanized 10-gauge rolls and flat panels and 6-gauge flat panels. All raw materials used meet ASTM A-82, and the finished products meet ASTM A-185 and the updated standard ASTM A-1064.